I ran across this photo while I was perusing the photos at the Library of Congress and I was totally blown away. Clinton Johnson took this photo, captioned “North Dakota Cyclone,” in an unknown North Dakota town in 1895, just six years after North Dakota statehood. It appears to depict a menacing tornado bearing down on a North Dakota town. If you look closely, you can see some people standing around, watching, proving that even in the 1800s, people were gawkers. Farmer A.A. Adams took the first ever photo of a tornado in Kansas in 1884, a feat which was overshadowed by another tornado photograph taken a few months later in South Dakota. I believe this is the first photograph ever taken of a tornado in North Dakota. You can read about the 1957 Fargo F5 tornado in Fargo Moorhead Lost and Found. We’re posting this photo here because a) it’s super cool, and b) there is a (very) slim chance that we might be able to identify this location. 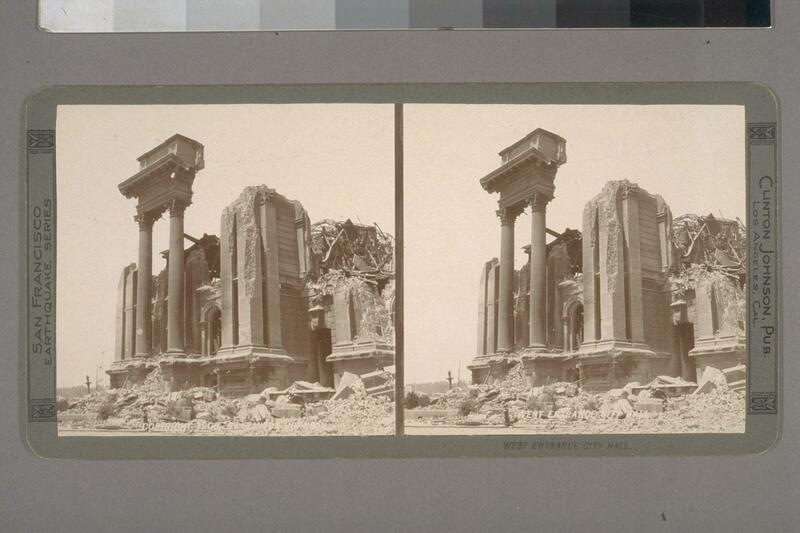 Mr. Johnson also appears to have also been one of the photographers who covered the San Francisco Earthquake in 1906. Do you know anymore about photographer Clinton Johnson or the location of this photograph? Please leave a comment. It looks like there might be 3 tornadoes in this photo. Really scary. The church looks like the little church (which now part of a historical section of town) in New Salem, ND. I’m sure a lot of churches looked like that around the turn of the century, but it might be worth checking out! Good luck – Cool photograph! I’m not sure it could be six miles away in this shot. Do you really think? I’m just guessing, but it looks like maybe two miles to me. It’s not one of those mile-wide F5s, it’s a little North Dakota F1 or F2 kickin’ up dirt, don’t you think? At any rate, I looked at the church in Auburn, about six miles from Grafton, and it is not a match. There is no church that I could see in Nash either, also about six miles from Grafton. Very few other choices that I see within a four mile circle of Grafton, so maybe you’re right, or maybe the church is now gone. In the photo he appears to be about 25 to 30 years old. Don’t know anything about Clinton Johnson but in reading some old history of the first Catholic Church in my hometown of Thompson, N.D. they mention that it was destroyed by a cyclone in 1985. No other info was given except they went on to build a new one. Picture looked a lot like the one the church was on. I know it is hard to tell scale in the picture, but from the flatness of the ground in the backround I would say some where in the eastern part of the state. If you look at a map of ND from 1895 you will see a lot of towns on the easten side of the the state. Also if Clinton Johnson was a railroad photographer you will see the majorty of the railroads on the eastern side of the state. Just a thought. Could be Drayton maybe. The church looks like it could be the methodist church. Not sure how long the church has been there but I know it’s got some historical value. Cool picture! Not sure, but maybe Antler, N.D.
Drayton Methodist Church is built out of brick and was completed in 1905-1906; not sure if the brick structure replaced an earlier one or not but I tend to think not…. There was a ferocious tornado at Antler, well documented, but that was 1911. Everyone loves a mystery! I know I do! The only clue seems to be the church and the clipping Barb Eltz provided (http://oldnews.aadl.org/node/131867) which apparently indicates there was at least one large and destructive tornado near Grafton in 1895. How many twisters were there in 1895? That and we only have a single frame – who knows if the twister grew or moved around from that instant when the photo was taken.